Well, I’ve been a lima bean all my life. I came from a nice, strong, if somewhat disfigured plant and pod. A few years ago, God poked me into the dirt and left me there, feeding and watering me as needed… and He waited. And I waited. 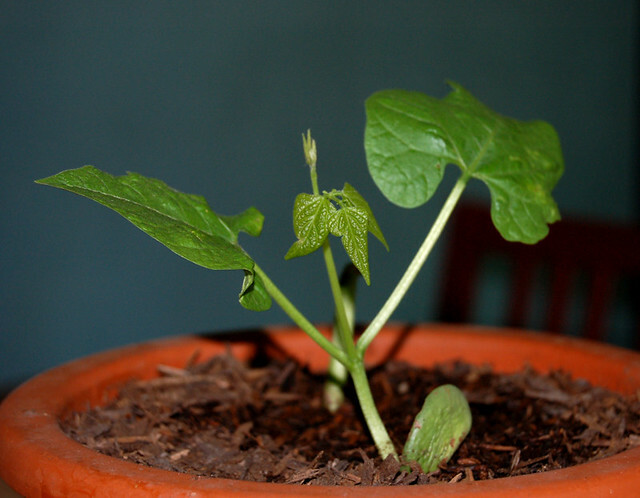 And now the tiny shoot of a new plant is poking out its head, bringing what is left of that lima bean into the sun. The new plant seems healthy and vibrant, though only a tiny part of its stem shows so far. The lima bean is still feeding it, but before long that bean will drop to the ground, and the new plant will look to the sun and the sky for its nourishment, with leafy branches raised high. This blog has been in the dirt since February while its gardener sought better fertilizer, a fresh source of water, and a place in less shade. Today it pokes its head out of the soil, seeking the sun. Check Mixing the Fertilizer for my updated treatment plan and goals. Soon I’ll make other updates and blog entries, as we watch the new plant grow!